Tennis is a game that can be very fun even at a young age. 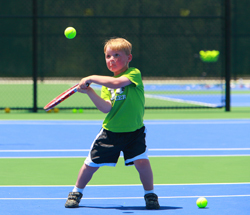 Your young tennis star will learn the right way to hold their racquet, the proper techniques of striking the ball, the rules along with the positioning of the of the game. Fun is the number one goal, as we will help your child build both love and knowledge for this game. Every player will always stay active and involved. Tennis racquet is needed to participate! No classes are currently available at this time. Please check back soon for updates. When life hands you lemons…play tennis! This one week long tennis camp is perfect for anyone who wants to have fun and step his or her tennis game up to the next level. Your child will get better every day, learning and refreshing on the ins and outs of the forehand, backhand, net play, and serving! The only equipment needed to play is a tennis racket. See you out on the court!